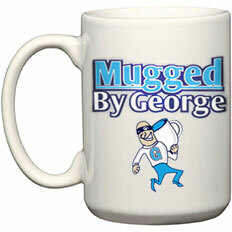 Muggedbygeorge.com is a small enterprise comprised of dedicated individuals committed to providing the best souvenir mugs available. We come from a varied background, however, we are all committed to superior customer service with your complete satisfaction as our goal. Ever reminded of the cost of production and shipping charges, we are constantly challenged to provide our customers with the BEST price. The Chief Mugger is responsible for overseeing the entire ordering and production operations and works hand in hand with those in the manufacturing process. Max, our Assistant Mugger, coordinates quality control with final product inspection prior to shipment. It’s our way of ensuring that what goes out the door is exactly what the customer ordered. The Muggers are the true heroes though; they toil away with the ovens, printers, computers, mugs, wraps, and all the other equipment necessary to produce your mugs, and they do it with love and enthusiasm. Give us a call. We stand ready to answer all of your questions and are anxious to work with you to develop your special mug, including any special art needs you might have.